Edinburgh Fringe review: Micky Cochrane, What The Fudge? Playing to a small audience in an intimate venue, Micky Cochrane dispenses with the formalities as he dances around the stage in his own trance, hinting at the fact that this may not be a run-of-the-mill comedy show. As Micky introduces himself, the venue, and the show, it’s clear that he has a confident audience rapport that belies his rookie stand-up status. The show’s title What the Fudge? is a fairly self-explanatory euphemism, appropriate for its “daytime TV” slot at the Fringe – although be warned that it’s certainly not children’s entertainment. The show itself is an exploration of Cochrane’s disjointed identity, and how he struggles to reconcile various aspects of his life. Always planning to become a Premiership footballer, we hear how Cochrane eventually took a different route to become an actor – earning him the label of being Middle Class. Unfortunately he is far too working class to become involved in the activist movements he would like to champion, confined instead to sharing petitions on Facebook. He is also a vegetarian, which in the macho sporty circles he grew up in as akin to having a deformity. Yet another problem arises when describing himself as a Geordie, despite being born in Gateshead – much to the chagrin of people from Newcastle. These topics and more are dealt with in an odd mix of stand-up, skits and poetry, no doubt influenced by his acting background. Much like his life, it seems, the show is a little disordered, and Micky’s personal anecdotes are interspersed with tangential rants on the Royal Family, Ant ‘n’ Dec, and Conservatism to beef up the show. In short, Micky is confused, and a little lost. Luckily he has found some solace in mindfulness – as he explains in a hilarious guided meditation which closes the show. 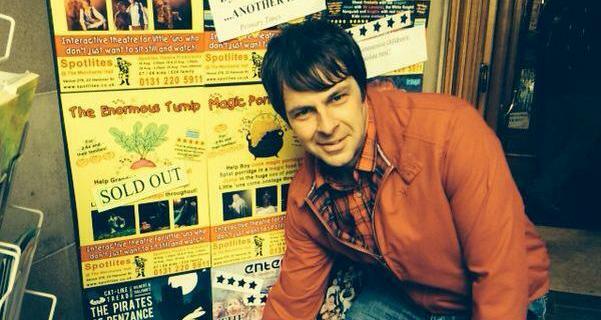 As a debut hour at the Fringe, What the Fudge? has all the elements of a great show, and Micky Cochrane is definitely a name to watch if he returns with a more structured show. His burgeoning style will enthral fans of Kevin Eldon and Rik Mayall, and appall fans of fox hunting or Robbie Williams.